Globally, dental caries and gingivitis negatively impact upon the health and quality of life of countless children.1,2 Caries is the commonest preventable infectious disease affecting children worldwide.3 The causal agent, Streptococcus mutans, thrives in an acidic environment where sugar is available.4 Bacteria are trapped in deposits of plaque on the gum line and cause gum inflammation and chronic periodontal disease. Domestic microbiome firms such as Bifido are entering the oral care probiotics market following growing interest in the hundreds of microorganisms that live in the mouth and affect general health. Research and commercialization of beneficial bacteria in the human body are in full swing due to the interest in human microbiomes. Markets and Markets, a market research company, estimate the global microbiome market to reach $500 million by 2022 and $900 million by 2025. Although gut microbiomes research has been the most prominent, there has been growing interest in oral lactobacillus that protects the health of the mouth from oral diseases such as dental caries, gingivitis, and chronic periodontitis. The World Health Organization raised concerns that non-infectious diseases or diseases that occur without pathogen infection are closely related to gum disease and that harmful bacteria in the mouth affect general health. Both industrialists and consumers have since become increasingly interested in creating healthy oral microbial ecosystems. “Oral care probiotics is the most active field of commercialization of microbiome research following intestinal microorganisms. With the recent interest in the microbiome industry, the sales growth of oral lactobacillus products is expected to increase further,” a Bifido official said. Bifido is a Korean microbiome firm known as the provider of probiotics such as ProsLab and BioGaia. The firm has also been developing a rheumatoid arthritis therapy with Catholic University Seoul St. Mary’s Hospital since 2017. Bifido is leading the commercialization of human microbiome products, having successfully cultivated CMU strains through technology developed from studying microorganisms for 30 years, cultivating egg culture bacteria, and commercializing products. Along with the development of patented human-derived Bifidobacteria BGN4 and BORI and commercialization of intestinal probiotics, Bifido is now expanding into the oral lactobacillus market to create oral probiotics such as Bifidus Denti for inflammatory diseases of the mouth and bad breath, the company said. It had reportedly led the market by commercializing a CMU strain for oral health. Weissella cibaria strain CMU, a representative oral care probiotic, is a patented oral lactic acid bacterium that is effective in suppressing bad breath. Dental therapists — a midlevel provider similar to a physician assistant or nurse practitioner — will be a new, licensed profession in Arizona. Arizona is the seventh U.S. state to allow dental therapy as a profession, said Kristen Mizzi Angelone, dental campaign manager for Pew Charitable Trusts. Under the law signed Wednesday by Gov. Doug Ducey, dental therapists will be allowed to practice only in certain settings — tribal settings, federally qualified health centers and other nonprofit community health centers treating low-income patients. The law will take effect Aug. 3. Dental therapy is seen by supporters as a way of addressing Arizona’s oral health needs because therapists will be able to perform a limited scope of procedures such as fillings, extractions and crowns at a lower cost. Members of the Tohono O’odham Nation southwest of Tucson were among the most vocal supporters of the legislation, as they see it as offering a career path for tribal members to remain on the reservation without spending as much money as it costs to go to dental school. Tribal members have also indicated interest in setting up dental therapy coursework at Tohono O’odham Community College. While Arizona tribes may hire federally certified dental therapists from out of state once the new law takes effect in August, it’s expected to be several years before Arizona schools start graduating dental therapists. The original dental therapy bill was sponsored by Sen. Nancy Barto, a Republican from Phoenix who has long said adding dental therapists is a “free market solution” to meeting oral health needs in the state. “Dental therapists are a proven workforce model that will increase affordable care options without creating new, burdensome regulations,” Barto said. When it comes to dental health, companies seem to more and more see consumer technology and insurance as natural partners. Beam Dental, which started out in the smart toothbrush space but expanded a few years ago into dental insurance, raised $22.5 million today. At the same time, quip, a smart toothbrush company that raised $10 million last year, acquired dental health plan Afora, in a move that mirrors Beam’s pivot. “With over 100 million Americans without any dental coverage at all, and many with coverage that doesn’t incentivize making the most of your covered preventative care, we feel it is essential to offer an alternative that can help more people visit the dentist more often, for less,” Simon Enever, CEO and cofounder of quip, said in a statement. “Bringing Afora into quip Labs allows us to accelerate this project towards our mission of supporting our members through all aspects of their oral care routine, from the products they use everyday, to the professionals they visit every six months”. quip offers its own ADA-approved electric toothbrush for $25, a subscription service that sends replacement heads every three months for $5 per shipment, and an online platform called Dental Connect. The platform helps dentists who sign up to remind patients about regular check-ups and reward them for coming in with free brushes. Choosing an appropriate adhesive resin cement for definitive cementation of indirect restorations can be challenging for patients requiring restorative treatment. 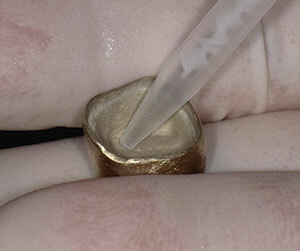 Ideal bond strength is necessary to ensure functional treatment durability. Likewise, cement shade stability is also important for long-term aesthetics; the color of adhesive resin cements affects how the shade of tooth substrates interacts with the optical properties of restorative materials and also affects shade matching with adjacent restorations or natural teeth. To simplify durable and aesthetic cementation of indirect restorations, a universal dual-cure adhesive resin cement system can be used (G-CEM LinkForce [GC America]). G-CEM LinkForce is a 3-component system for predictably and securely placing ceramic, resin, and metal-based inlay, onlay, crown, and bridge restorations. Ideal when adhesive bonding is required to ensure adequate strength of stacked feldspathic ceramic, pressed leucite ceramic, and/or lithium disilicate restorations (eg, GC Initial LiSi Press High Density Micronization (HDM) high-strength pressable lithium disilicate), it is also beneficial when a lack of retention form prevents mechanical retention—as with partial coverage, inlay, onlay, or veneer restorations—regardless of restorative material. The G-CEM LinkForce self-cure mode is advantageous in situations in which restorations are thick, opaque, or located in areas that cannot confidently be thoroughly light cured. It is also indicated for the cementation of metal, ceramic, and fiber posts, as well as cast post and cores. 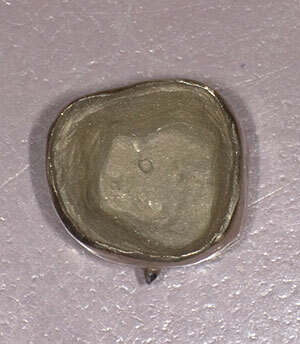 Its universal application also includes permanent cementation of crowns and bridges on implant abutments. Figure 1. 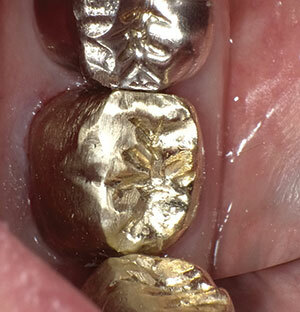 View of the intaglio surface of the full cast gold crown for tooth No. 31 prior to micro air abrasion/etching. Figure 2. 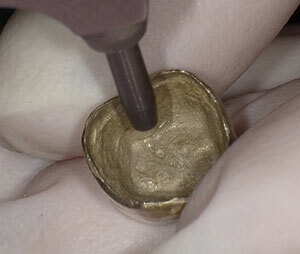 View of the intaglio surface of the full cast gold crown after micro air abrasion. Figure 3. To begin loading cement into the crown, the nozzle was placed at the base. Figure 4. Using the nozzle to paint the internal walls of the restoration with cement, the cement was introduced into the crown. Figure 5. Postoperative view of the crown restoration following cementation, with excess cement removed and ready for full function. Unlike other dual- and self-cure cements that color shift over time, G-CEM LinkForce remains color stable, exhibits tooth-like fluorescence, and is available in corresponding try-in pastes. This allows dentists and patients to accurately preview aesthetics before permanent cementation. The G-CEM LinkForce system includes (1) G-CEM LinkForce Resin Cement; (2) G-Multi Primer for stable chemical adhesion, coupling between adhesive-treated and restoration surfaces; (3) G-Premio BOND universal adhesive bonding agent for self-etch, selective-etch, and/or total-etch adhesive bonding; and (4) G-Premio BOND Dual Cure Activator for achieving high bond strengths when self-curing is required. In the case of a 71-year-old male patient, G-CEM LinkForce was ideal for cementing a full-cast gold crown restoration to treat tooth No. 31. Prior to delivery, the intaglio surface of the restoration was properly prepared chairside with micro air abrasion (Etchmaster [Groman]). At the cementation appointment, the provisional restoration was removed and the preparation thoroughly cleaned. The definitive restoration was tried in. After confirming patient approval, the restoration was removed and dried. G-Multi Primer was applied to the intaglio surface of the restoration and dried with an air syringe. Meticulous isolation was established, the preparation was rinsed and dried, and then the preparation was selectively etched and dried. When light-curing, G-Premio BOND is applied, allowed to set for 10 seconds, air dried for 5 seconds, and light cured for 10 seconds. When using dual-cure mode, G-Premio Bond and DCA are applied in a 1:1 ratio, allowed to set for 20 seconds, and air dried for 5 seconds. G-CEM LinkForce in Shade A2 was extruded directly into the restoration, which was immediately seated onto the preparation while maintaining pressure. The cement was tack cured for 2 to 4 seconds to facilitate easier, atraumatic cleanup by allowing for easy peeling off of the excess. The restoration was then light cured from each surface/margin for 20 seconds. Overall, using G-CEM LinkForce contributed to a more comfortable patient experience during a simplified cementation appointment while simultaneously ensuring a secure, aesthetically predictable restoration. 6-year-old Caleb Sears stopped breathing after receiving several different kinds of intravenous anesthetics during a tooth extraction. 5-year-old Amber Athwal suffered brain damage after receiving general anesthesia to extract some of her teeth. 17-year-old Sydney Gallegher died nearly a week after she suffered cardiac arrest after having her wisdom teeth pulled. An investigation by the local ABC affiliate in Austin, Texas, identified at least 85 patients in Texas who died shortly following dental procedures from 2010 to 2015. We offer seven keys to preventing more patients—especially children—from dying from dental sedation. The AAPD guideline, which applies not just to dental procedures but to sedation for all procedures, notes that children under the age of 6 years (and especially those under the age of 6 months) are particularly likely to suffer adverse events during sedation. It emphasizes that there is a very narrow margin in children between the intended level of sedation and much deeper sedation or anesthesia. The guideline notes that these skills are likely best maintained with frequent simulation and team training for the management of rare events. Without appropriate and trained personnel attending to the sedated dental patient—­and, particularly, children, as noted in the AAPD guideline—the safety of the patient is at risk. Sure, the practitioner may be embarrassed over having allowed an adverse event to occur. However, any embarrassment is preferable to the death of the patient. We cannot stress this point enough. Do not delay in calling 911. We must emphasize that every person in the dental practice, including clerical and front office staff, has a responsibility in an emergency. The only way to prepare all for such emergencies is to practice or perform drills. Since many dental practices employ part-time employees, that means drills must be performed on multiple occasions so all employees are familiar with their roles in emergencies. Being prepared is a key to managing adverse events and taking steps to avoid patient deaths. We recommend two related tools to be prepared: pre-procedure huddles (briefings) and post-procedure debriefings. These meetings offer the opportunity to both plan for contingencies ahead of time and to analyze things that might have been done better after a procedure. We also encourage the use of checklists as a reminder of the key steps to be followed. 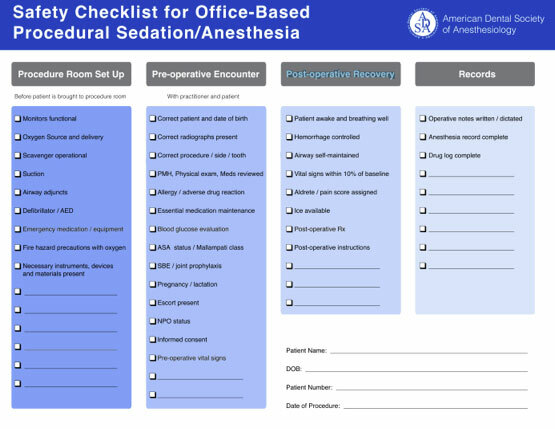 The American Dental Society of Anesthesiology provides a Safety Checklist for Office-Based Procedural Sedation/Anesthesia (see the figure). This checklist has broken down key considerations along the continuum of care: procedure room setup, pre-operative encounter, post-operative recovery, and records. Although we cannot say for certain whether these seven keys would have saved the lives of Caleb, Amber, and Sydney, we do know that the application of a higher standard of care, in accordance with AAPD recommendations, might indeed save the life of another patient. Dr. Truax of the Truax Group is board-certified in neurology and internal medicine. A clinician and educator with more than 20 years of experience in medical administration, he has been involved in patient safety for more than 25 years. He was trained at Johns Hopkins Hospital and Massachusetts General Hospital. And, he was a clinical association professor of neurology at the SUNY Buffalo School of Medicine. He can be reached at btruax@patientsafetysolutions.com. Mr. Wong is the founder and executive director of the Physician-Patient Alliance for Health & Safety. A graduate of Johns Hopkins University and a former practicing attorney, he is a recognized healthcare and patient safety expert. Also, he is a founding member of the American Board of Patient Safety and a member of the editorial board of the Journal for Patient Compliance. He can be reached at mwong@ppahs.org. According to Nobel Biocare’s All-on-4 treatment concept manual, a minimum of 5.0 mm in bone width and 8.0 mm in bone height is necessary to begin the procedure.3 (All-On-4 is a registered patent owned by Nobel Biocare developed together with Paulo Malo, DDS, PhD, at the MALO CLINIC.) Though the All-on-4 technique claims to eliminate the need for bone augmentations and sinus lifts, these procedures cannot always be eliminated if the bone quantity does not meet the requirements due to the large diameter of a conventional implant.1-2,4 While the All-on-4 technique offers acceptable support with 4 implants, the endosseous procedure is still invasive and time consuming compared to the immediate and early loading procedures used with mini dental implants. It is said that a first impression is everything, and this is especially true in the field of dentistry. The art and science of taking an excellent impression plays a critical role in the restorative process. Without a stable and accurate replica of the patient’s dentition and surrounding soft-tissue landmarks, creating an accurate and well-fitting dental prosthesis or lab-fabricated restoration is virtually impossible. Impression materials provide a straightforward and reliable method of producing the negative likeness of a patient’s tooth structure and surrounding soft-tissue landmarks needed to finalize a prosthesis or indirect restoration. One major problem is that most dentists rely on only one impression material to address all clinical needs. Clinicians may be better served to stock more than one type of impression material to accommodate a variety of clinical situations. Think back to the “dark days” of dental school. Somewhere buried in the curriculum of prosthodontics, restorative, orthodontics, and periodontics, there was some mention of oral pathology. Apparently, since you would be spending your career looking into the mouths of your patients, you needed some instruction on the inspection and diagnosis of a variety of lesions of the oral cavity. During your coursework you undoubtedly learned about leukoplakia and erythroplakia, as well as the possibility that some of these lesions might progress to oral cavity squamous cell carcinoma (OCSCC). You were taught that any ulcer that did not heal, erythroplakia, or suspicious appearing leukoplakia warranted a biopsy to rule out an early cancer.